Want to make getting up for work on a Monday morning just that little bit easier? Having to choose something to wear that looks nice can quickly turn from a fun task into a nightmare. For this we suggest grabbing a new outfit to throw on the morning that is comfortable, stylish and won’t cost your whole weeks paycheck! Tweed is a traditional office material and has a professional look, but it doesn’t have to look old. This fitted tweed skirt from FATE is perfect for winter workwear with a pair of black tights and a plain black top. If your workplace is more corporate, pair with a plain workshirt, if it’s more casual, a fun cardigan with lift the look. Office style so often gets stuck in grey and black tones, so why not add a print into the mix? 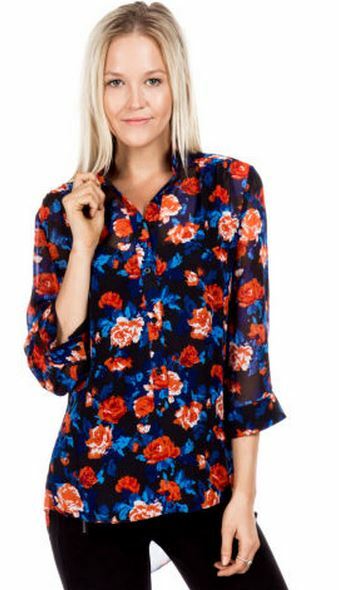 A floral printed shirt adds sophisticated colour to a plain outfit without being over the top and will even pass to wear on the weekend going out for lunch or drinks. Don’t be scared of bold colour at work. In the right shade, a statement colour piece will stand out in all the right ways. We love this orange blazer for the office as the colour isn’t too crazy and the cream pockets and button accents give it a sophisticated style. Don’t like colour? Go for textures! If you’ve got more of a laid back style or you’re not a massive fan of colour, a textured jacket will add an element of interest to any outfit. This textured patterned jacket can be dressed up with essential workwear items or dressed down with a pair of jeans. Nothing looks more elegant than classic black and white. Create a fabulous silhouette with this sheer white and black FATE blouse over a black or white camisole. Pair with a classic black pencil skirt and some on trend skinny strap sandals. Follow Catch Culture for all the inside tips and tricks behind Catch of the Day!